solar cost drop Archives - Solar Love! 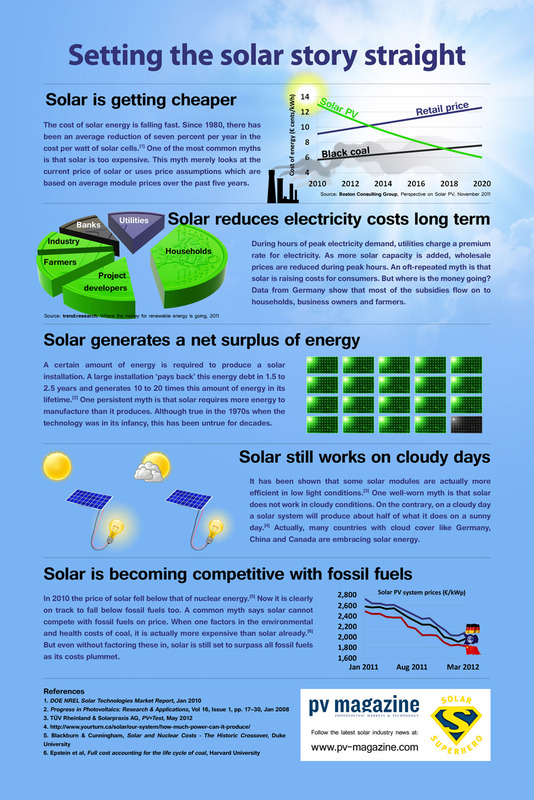 Home Tags Posts tagged with "solar cost drop"
Here’s another fun infographic Cost of Solar recently shared. This one’s on 5 big solar myths, and quick debunkings of them. For more commentary, check out the full Cost of Solar article: Disadvantages Of Solar Energy Debunked. Last week, we published an article showing why the cost of solar is probably 2–100 times cheaper than you think. With so many people thinking that solar power costs much more than it actually does, one would think that no one is going solar, right? Well, with the advantages of solar power starting to get out there more, and with the cost of going solar beating the heck out of the price of electricity in an increasing number of places, solar power is growing fast in the US. For sure, this is just the beginning, but have a look at these solar power growth charts below for a quick look at recent trends, followed by more on the advantages of solar power. Going Solar Is Getting Popular — Check Out These Charts! With the cost solar dropping so much and beating the heck out of the price of electricity in an increasing number of places, solar power is growing fast in the US. For sure, this is just the beginning, but have a look at these solar power growth charts below for a quick look at how popular going solar is becoming. 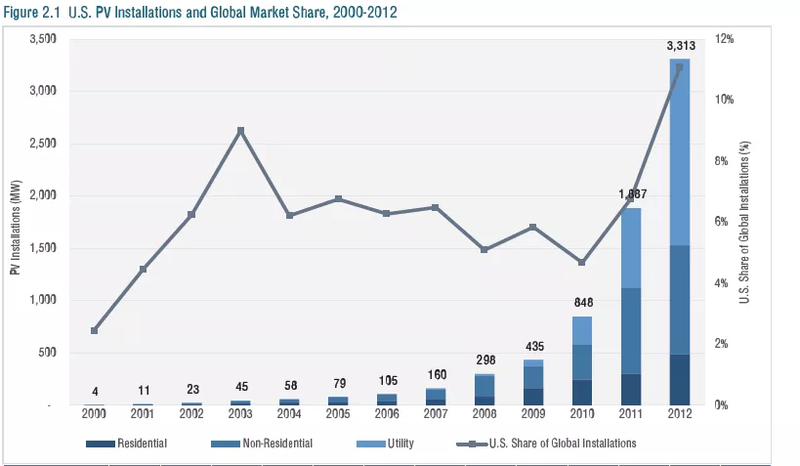 Residential solar power growth has increased tremendously in the past few years. Utility solar power growth is also strong. Going solar is clearly getting competitive at every level. It’s important to note that Q4 is always the strongest quarter of the year for solar power installations, and Q1 is always the weakest. This is due to reasons concerning taxes and solar incentives. 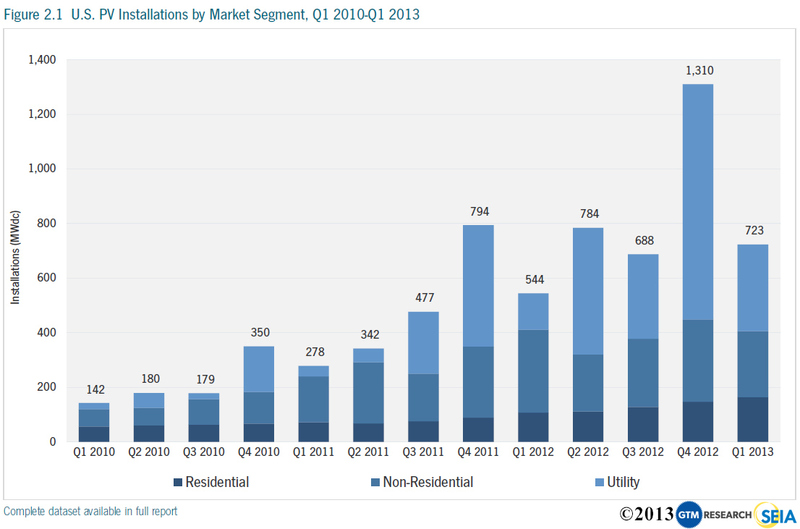 Even so, Q1 2013 was the 4th best quarter for US solar power installations… ever. Also, while overall solar power installations dropped, residential solar power installations actually increased from Q4 2012 to Q1 2013! This year, solar power is projected to become the #2 source new US power capacity. Watch as Q2 through Q4 pick up in installation capacity. But solar power’s growth isn’t expected to slow down following 2013. Going solar will keep increasing as more and more people realize that solar power costs less than electricity from the grid, and US solar power installations will climb higher and higher like a mountain. Here are projections from GTM Research and the Solar Energy Industries Association.